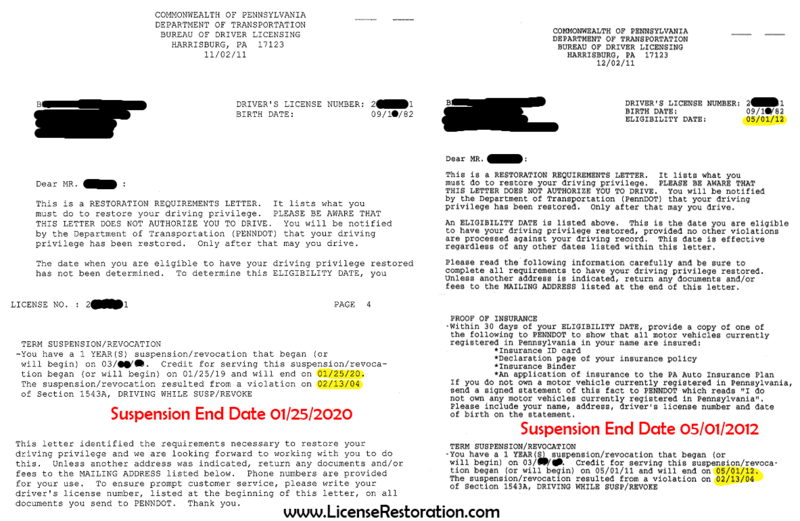 PennDOT Said License Suspended For 8 Years – We Fixed That! B came to see License Restoration Services in November with his license suspended till 2020! You can see from the first half of the image below that his PennDOT had his license suspended to 01/25/2020 because of issues going back to 2004. There were a bunch of old violations that should have been over years ago and after we completed our investigation we found the problems. We were able to explain to B what we need to do, and that with some work we could have him driving legally in May of 2012. It was still a few months away, but it was much sooner than 2020! In the image below you will see what his Restoration Requirements Letter looked like when B hired us in November on the right. On the left you can see the new eligibility date on his restoration letter. If you have old license suspension issues still haunting you, give License Restoration Services a call. It may help you save a few years of license suspension time.